It's official, Truthseekers. Silly season is upon us. It's almost time for the midterm elections, and at least one result is already in -- the political ads are crazier than ever. Let's begin with a truly nauseating ad for Rick Scott, which parodies the nauseating TLC reality TV show "Say Yes to the Dress." Except this one (allegedly paid for by college republicans) is called -- wait for it -- "Say Yes to Rick Scott." 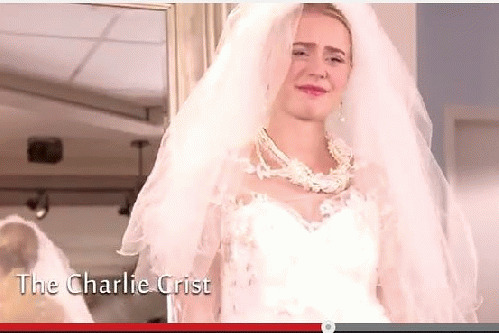 And the cute blonde bride-to-be is literally trying him on, as a dress. That's right, she wants to wear "The Rick Scott." "'The Rick Scott is perfect,' says our blond and youthful heroine, Brittany, admiring herself in the mirror while wearing a wedding dress, which is a thing Republicans have heard women like to wear. Her friends ooh and aah. But mom, who is of course a harridan because she dared age past 35, has other ideas. 'I like the Charlie Crist,' she says, as we see Brittany -- an undecided voter, by the way -- in a frumpier dress. 'It's expensive and a little outdated, but I know best.' Ominous music. I can't figure out which is worse, the idea that an intelligent young woman would want to identify herself with a man who wants to overturn Roe vs Wade and force young women to carry babies -- even if raped and impregnated by a family member -- or the concept of physically "wearing" this misogynistic jerk. Or as Slate posited, perhaps a crew of Democratic moles infiltrated the ad agency and cooked this one up -- it's that freaky. The "lets wear a Republican" concept is completely out-of-touch, but the prize for moral reprehensibility goes to Arizona republican candidate for congress Wendy Rogers for using the ISIS beheading video of reporter James Foley in her attack ad against Democratic incumbent Krysten Sinema. "'Terrorists threats are growing. Are we secure? Are we protected?' a narrator says in the ad over images that include Foley kneeling next to his masked captor. 'Keeping us safe and secure is Congress's job. Kyrsten Sinema hasn't done her job.' The ad accuses Sinema of voting to give terrorists full legal rights and to allow terrorists imprisoned at Guantanamo Bay, Cuba, to return to their home countries. 'It's true. It's wrong,' the narrator continues. 'Kyrsten Sinema allowed her liberal agenda to get in the way of our safety.'" Who would've thought the pig castration ad from would-be Iowa senator Joni Ernst would be the height of GOP taste and propriety this election season?